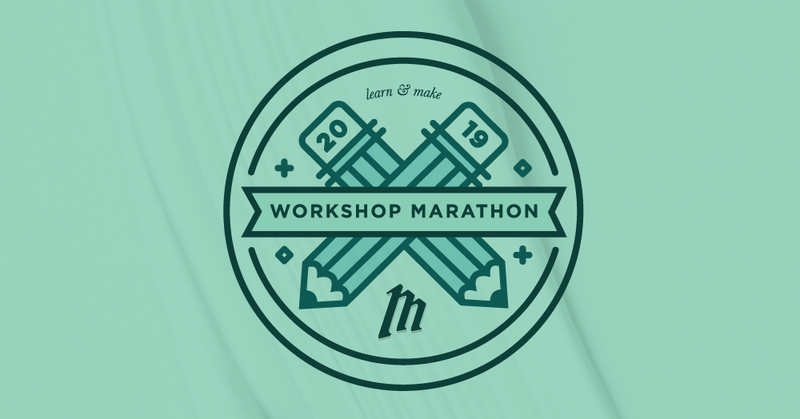 Kickoff spring like never before with our Workshop Marathon: Spring Edition as we host 8 amazing workshops all in the same day on Saturday, April 27th. We've collected some of the most talented makers + small business owners in our area, to bring you workshops you won't be able to resist. From a morning filled with business-focused workshops to a full afternoon of hands-on learning, there's a workshop for everyone! Join us to learn how to grow your passions, meet other people, and have fun! Special thank you to the Dakota West Arts Council for helping us fund this event. It’s support like there’s that allow us to serve the maker community. Enjoy a full morning of learning the in's and out's of several topics to get your hobby going as a side hustle or to grow your business into its highest potential. Learn how to create a website from start to finish in 14 days, be productive every day, how to price your products and services, and how to manage your finances. Surely, you'll leave with a full tool set ready to take your passion to the next level. In a world where everybody seems to be ‘busy’, this workshop taught by Taylor Daniel will be a crash course filled with facts, benefits, and tips & tricks on how you can manage your business, health, and purpose. This workshop will be April 27th at 8-9am at CoStudio in Bismarck. Limited to 25 spots. Join Kyle and Claudia from Widmer Roel in discussing the choice of entity for your small business, what type of expenses can be deducted to save you money, and how to plan ahead for financial success. Ready to get on track with your finances? This workshop will be April 27th at 9:15-10:15am at CoStudio in Bismarck. Limited to 25 spots. Join Kari Olson and learn how to build your website without wasting months DIY’ing or spending thousands of dollars creating your first successful website. You'll learn why you need a stand-out website to begin making more money, a step-by-step process to build a beautiful website that converts, and how to launch it in just 14 days. This workshop will be April 27th at 10:30-11:30am at CoStudio in Bismarck. Limited to 25 spots. Determining your prices can be tricky... its hard to price something you love to do! But, the price of your product or service is one of the most important business decisions you make. Join Tait Sundstrom's workshop on pricing where's he'll teach you exactly how to price your passions so you can make a living doing what you love most. Ready to dive in? This workshop will be April 27th at 11:45-12:45am at CoStudio in Bismarck. Limited to 25 spots. A key part to learning is keeping a fresh mind (and stomach) so we're taking a lunch break from 12:45 - 1:30pm to provide a delicious, local lunch from Up North Catering. Ready to make with your hands? We have a full afternoon of fun learning as you dive deeper into the world of painting, wine pairings, string art signs, and the perfect succulent garden for your home. You'll walk away with new tips and tricks for your family and friends to enjoy. Join local artist, Medora Frei, as she hosts an interactive painting workshop. She’ll focus on how to use abstract painting as a tool for healing and self-expression. You’ll start the class by learning about abstract basics and end it with creating your own masterpiece! All needed art materials will be provided! Just come ready to paint. This workshop will be April 27th at 1:30-2:30pm at CoStudio in Bismarck. Limited to 25 spots. Hosting a party or out to eat? Wondering what the perfect wine might be for your plate? Join Taylor Abler from Anima Cucina as he goes through the basics of wine pairing, some misconceptions, and of course, some tasting. *This workshop does require the purchase of an additional $15 wine ticket so you can enjoy all of the pairings during the workshop. This workshop will be April 27th at 2:45-3:45pm at CoStudio in Bismarck. Limited to 25 spots. Want to learn a new craft or create a new piece of decor for your home? Join Kelsey Stone with Kb Designs in creating your own String Art Sign. This technique is a fun and different way to add texture to your home. You will learn all the basics as she walks you through the process of creating String Art, while also providing several designs and color variations to choose from. This workshop will be April 27th at 4-5pm at CoStudio in Bismarck. Limited to 25 spots. Get ready to get your hands dirty! Experience the calming effects of working with plants to create your “path” with a fun succulent garden. Learn handling, planting, and care techniques along with how to properly propagate succulents with Melanie Lennie from Beyond The Blooms. This workshop will be April 27th at 5:15-6:15pm at CoStudio in Bismarck. Limited to 25 spots. "The workshop hosts did an incredible job fielding questions, offering information, demonstrating techniques, and allowing the audience to be hands on. I left feeling super motivated." "The camaraderie! Everyone was having a great time and learning from one another. It was also well-organized and had a gorgeous aesthetic, the perfect environment for workshops." "I loved being surrounded and learning from people who are passionate about their craft. They were truly inspiring!"